Note: This is the second book in Summer trilogy, and the summary below may contain spoilers. You can see my review of the first book, The Summer I Turned Pretty, here. Goodreads Summary: Can summer be truly summer without Cousins Beach? It used to be that Belly counted the days until summer, until she was back at Cousins Beach with Conrad and Jeremiah. But not this year. Not after Susannah got sick again and Conrad stopped caring. Everything that was right and good has fallen apart, leaving Belly wishing summer would never come. I enjoyed the first book in the Summer trilogy, and it left me wanting to know what happened next. It's Not Summer Without You shows the characters in a new light and tells a story that is even more intense. 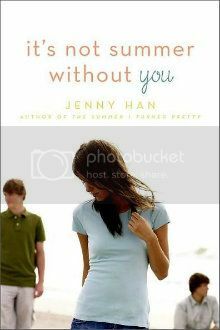 It's Not Summer Without You takes place the summer after the first book. In the interim year, so many things changed for Belly. For the first time ever, she isn't spending her summer at Cousins Beach. And no matter how many parties her friend Taylor takes her to, all Belly really wants is to be back at Cousins. But then Jeremiah calls Belly and tells her that Conrad is missing, and Belly doesn't hesitate when Jeremiah asks for her help in finding him. Together they search for Conrad, but really, they are searching for what they once had - their carefree summers at Cousins Beach. The Summer I Turned Pretty, though I enjoyed it, also seemed to set the stage for what happened in this book. Conrad and Jeremiah had always been close as brothers, but after the events of the past year, Conrad began pulling away from everyone. Even Jeremiah has become more serious and less lighthearted. And yet Belly is still the same as always - she wants to be accepted by Conrad and Jeremiah, spend time with them, and her feelings for one of the brothers haven't gone away. This book was darker than the first one, examining how people deal with grief and separation. The pain in certain moments was almost tangible, and I suffered along with the characters. Throughout the book we see how for Belly, Jeremiah, and Conrad, some people in life are irreplaceable and also that some things are worth holding on to. Once again there are flashbacks in this book, showing what happened throughout the past year, and I was glad to know everything that happened. However, as with the first book, I found myself wanting more of the story. Even though this book was more intense - the carefree summer gone and replaced with a time of people needing help and comfort - it was still a quick read, and the ending came far too soon. With some of the events in this book, the stakes for all three of the main characters became higher, and I want to know how things work out for them. Once again I'm glad that all of these books have been published. The story of Belly, Conrad, and Jeremiah is easy to get lost in, and I am looking forward to the final installment! I've been interested in this series for a while, and you've just convinced me to go and pick it up! Great review!